Since signing a university partnership with the Tokyo Organising Committee of the Olympic and Paralympic Games in June 2014, Toyo University has implemented various initiatives toward the Tokyo 2020 Games. As part of such initiatives, the University has offered a university-wide general course titled “Olympic and Paralympic Program: Philosophical Exploration of the Olympic and Paralympic Games” targeting students at all faculties from the AY2015 fall semester. University-wide general courses are interdisciplinary courses across the borders between disciplines, including the humanities, social sciences, and natural sciences, or between courses. This type of course is one of the unique educational features of Toyo University as a general university. The interactive remote class system enables students on any of the five campuses-Hakusan, Akabanedai, Asaka, Kawagoe, and Itakura-to attend these courses online simultaneously. The Olympic and Paralympic Program is an embodiment, in the form of a regular course familiar to students, of Toyo University’s aspirations to create a movement in which all students can participate beyond the borders between faculties or campuses and to develop human resources through sports. The Olympic and Paralympic Program is comprised of 15 classes each in the spring and fall semesters. Taught by several instructors, the classes in lecture style deal with various themes. Since the University has many specialists in sports-related fields among its faculty members, the Olympic and Paralympic Program classes can cover a wide range of subjects, mainly these specialists’ fields of interest, including history, social issues, law, scientific training, nutrition management, and tourism. This wide lineup means that the Games, where top athletes from around the world compete, are a special event related to not only sports in a precise sense but also all academic disciplines. 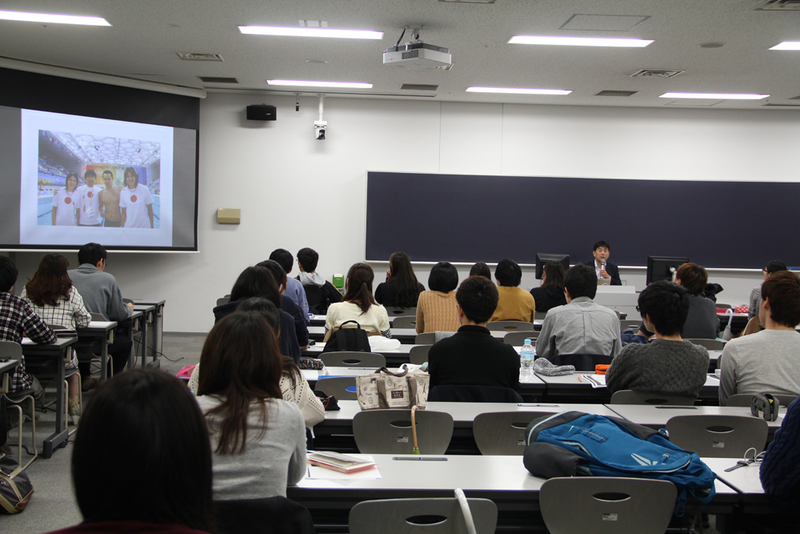 To provide students with opportunities to listen to leading figures with practical experience, some classes are taught by former Olympians, Paralympians, or Japanese National Team Head Coaches, who are familiar with sports at the highest level, or by outside specialists in volunteer activities and other fields invited as guest speakers. It can be said that this intellectually inspiring program, which deals with a wide range of subjects taught by outstanding instructors, is a crystallization of the comprehensive capabilities of Toyo University, which has accomplished significant achievements both in education in diverse fields unique to a general university and in athlete training. The Olympic and Paralympic Program will allow students to not only deepen their understanding of the Olympic and Paralympic Games, taking advantage of the wonderful opportunity of the Games to be hosted by Japan, but also learn, from vivid experience, to consider various matters from diverse perspectives. Historically, the Olympic Games were established by Baron Coubertin, a French educator, under the principles of human education, international exchange, and world peace, as a modern revival of the ancient Olympic Games, which continued to be held in ancient Greece for nearly 1,200 years. The Games held every four years are the largest and highest-level sports festival in the world in the true sense of the word. Despite such a brilliant character of the Games, however, the Games have actually entailed social challenges, including doping, political use of the Games, discrimination, and economic inequality. The Games embody both the lofty ideal of universal value independent from the times and countries and various challenges actually faced by people around the world. Our efforts to develop human resources who can continue to consider from a broad perspective the ideal states of Japan and the world amid conflict between the ideal and the challenges both embodied by the Games will lead to the University’s TOYO SPORTS VISION. Through this program, it is hoped that students at Toyo University, which has “philosophy” as the core of its founding spirit, will learn diverse values from around the world and adopt a positive attitude toward deeply considering things from a philosophical perspective. In January 2019, the contents of this program were published as a book. Aiming to connect people, society, and the world through the Olympic and Paralympic Games, this book introduces readers to the 23 themes of the popular classes, to invite them to develop a deep understanding and independent thought.